movements and ramming cruiser Hipper. British minelayers arrive off Norway and are surprised by German navy preparing to invade Norway. 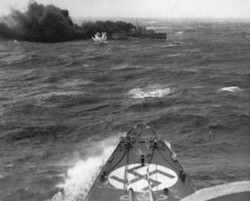 In heavy fighting, the destroyer HMS Glowworm is sunk while ramming German heavy cruiser Admiral Hipper. The Polish submarine ‘Orzel’ sinks the German transport ship ‘Rio de Janeiro’ at 11:50. After a temporary lull, the Luftwaffe launches a heavy attack against Coventry. The British ‘Northern Force’ captures Massawa, the last Italian stronghold in Eritrea. This removes any remaining threat to British convoys sailing through the Red Sea. A US delegation led by special presidential advisor Harry L. Hopkins and joint Chiefs of Staff Chairman General George C. Marshall arrive in Britain to discuss US and British strategy on the Second Front. The proposal they brought from Roosevelt, was for major landings on the French coast in the summer of 1943, with Antwerp as the initial objective, and for a similar but smaller operation in 1942 to take advantage of a sudden German disintegration or to stave off an imminent Russian collapse. The badly damaged cruiser HMS Penelope limps in to Gibraltar. The Russians reach the Slovakian border. The also continue their advance into Romania. The final Russian offensive to destroy the German 17th Army in Crimea begins. The 2nd Ukrainian front continues its advance into northern Czechoslovakia and establishes a bridgehead across the rivers Morava and Donau (East and Northeast of Vienna). Heavy fighting in the centre of Vienna. The Red Air Force drops 1,500 tons of bombs on Konigsberg. British SAS Brigade paratroops into eastern Holland, to clear the way for Canadians troops who are moving North. The British Second Army reaches Hildesheim, while the US Seventh Army captures Pforzheim near the upper Rhine.